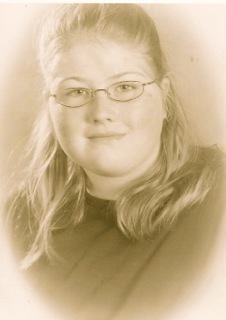 On the morning of May 12, 2010, 15-year-old Alex Moore abandoned her usual school uniform of tan pants and a blue shirt. She wore a sweatshirt, a comfortable pair of black pants, and brown slip-on shoes instead. She put on the double-heart necklace her mother gave her for Valentine’s Day. It’s inscription: “A Mother Holds Her Daughter’s Heart Forever.” She even picked up her room and made her bed. Instead of boarding the bus to Jemison High School in Jemison, AL to undergo another torturous round of disdain, contempt, ridicule and humiliation, she walked less than a mile, over a short hill, to Collins Chapel Bridge Overpass over I-65. At 6:50 a.m., Alex Moore jumped into morning rush-hour traffic. 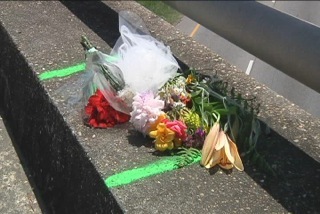 Flowers mark the spot where Alex jumped into morning rush-hour traffic. I have had the pleasure to meet Alex’s parents. They want you to know what happened to their beloved daughter, and what’s happening to hundreds of thousands of other beloved daughters right now in our public and private schools. Alex had her pants, including her underwear, pulled down to her ankles in class. Not one person tried to protect her, including kids who went to church that week. Instead many laughed at her, enjoying her humiliation. 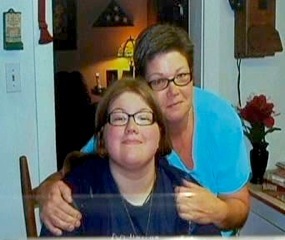 She was imprisoned in an unlit janitor’s closet for more than two hours. Bystanders refused to honor her plea for rescue and protection. She was the subject of laser-like contempt in what the senior boys at Jemison called the “Pig Race.” This is where, in a premeditated act of cruelty and humiliation, they created a list of whom they deemed the ugliest girls in school. Then at the appointed time, they would run to just one, giving her a Judas-like kiss on the cheek. Whoever got to the “pig” first won. Such cruelty would bring lawsuits in the adult world, but in our schools, both public and Christian, they often bring glee and laughter instead. What would you say to your daughter if such cruelty were unleashed upon her? Einstein said that each of us must answer a fundamental question: “Is the universe a friendly place?” How would you respond? Now here’s the question that The Protectors has been asking for nearly 10 years: Where is the Church and people of faith? Right now they are largely missing, but together we can change this fact. Jill Moore hugs her daughter Alex. Compassion is not what Alex Moore, a devout Christian, and so many like her need most. What innocent targets of bullying need most are strong, God-loving shoulders to stand on. They need Protectors—fellow students, teachers, coaches, youth pastors and more—to act upon their God given capacity to recognize intentional cruelty and evil, and employ their God-given capacity to combat it. That’s faith in action. And that is what The Protectors is all about. It’s too late for The Protectors, the only faith-based solution of its kind, to help Alex Moore. But together we can help the hundreds of thousands just like her through our upcoming faith-based program, the only one of its kind in the nation, designed to raise up a new and courageous generation of youth who have the tools, passion and faith to stand up to bullying—the most prevalent form of violence our children experience today. What is a life worth? Your donation to this noble cause is part of that answer that Jill Moore and so many like her ask every day. To join us today and to give the gift of freedom this holiday season, click here: Hero in You Faith-Based Anti-Bullying Program. Campaign ends December 31.